Wrestling | Clarksville Sports Network - Clarksville Tennessee's most trusted source for sports, including Austin Peay State University. Clarksville, TN – Being able to defend yourself is nothing new, but in today’s world, it’s become even more important. In the world of Brazilian Jiu-Jitsu, self defense is just one of the many benefits of the training. It’s a discipline. It’s respect. 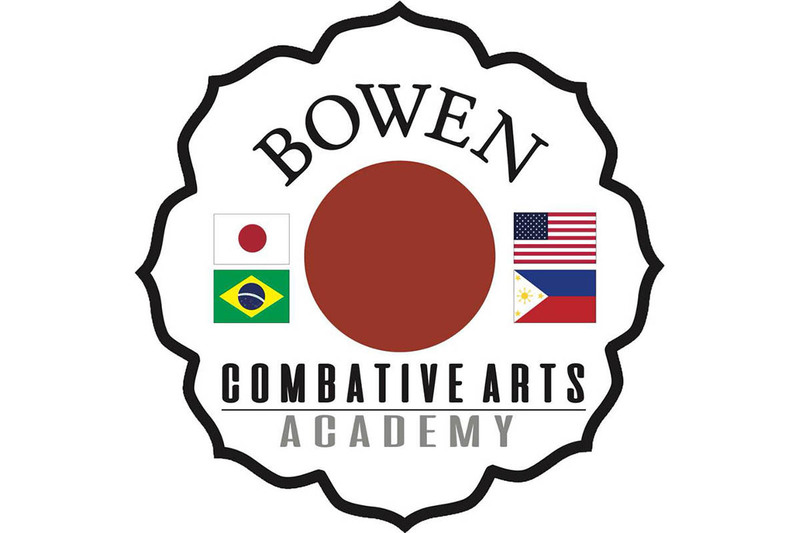 Brazilian Jiu-Jitsu is a martial art and combat sport system that focuses on “grappling”, especially ground fighting. BJJ was formed from Kodokan judo ground fighting, and eventually came to be its own combat sport. Nashville, TN – Okay, I admit it. I was never that big of a wrestling fan. You know why – it seemed fake, was too scripted, so overly dramatic and always over the top. But I had friends who loved it. My college roommate would often reenact a Jimmy “The Superfly” Snuka leap off of his bed straight onto yours truly further alienating me from the entertainment value of the sport. 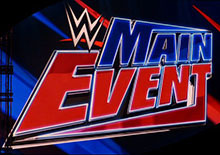 However, attending the WWE SmackDown Live on August 2nd, 2016 at the Bridgestone Arena in Nashville, Tennessee might have finally tilted me toward fandom – or, at least provided me with extreme appreciation for the empire that Vince McMahon and Company have built over the past four decades. Clarksville, TN – The local high school wrestling season comes to a close this week, adding significance to the last district duals. Thursday, the Northwest Vikings hosted what was scheduled to be a quad meet, but ended up being a short triangular meet with the Beech Buccaneers and the Clarksville High Wildcats. At the end of the night, it was the Buccaneers and the Wildcats who picked up important wins. The Wildcats split the night, losing to the Buccaneers, then finishing with a win over the Vikings. Clarksville High Wrestling gets win against Northwest but losses to Beech, Thursday night. 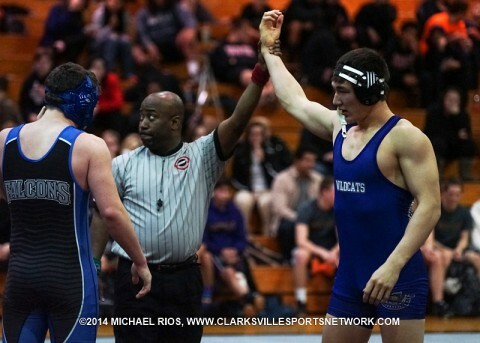 Clarksville, TN – It was Senior Night Wednesday, January 7th in William Workman Gymnasium at Clarksville High School. In addition to paying tribute to the 12 graduating senior wrestlers, the Wildcats hosted a triangular meet against the Rossview Hawks and the Fort Campbell Falcons. However, instead of celebrating victories at their last home meet, the Wildcat seniors suffered defeats against both the Hawks and the Falcons. Clarksville High Wrestling drops two at triangular meet Wednesday night. Clarksville, TN – The Clarksville High School Wildcats welcomed wrestlers from 13 other schools to William Workman Gymnasium Saturday for Slamfest 2014. Then, the Wildcats did their best to beat them all by earning a top spot in their pool in the morning and advancing all the way to the championship match at the end of the day. However, the Wildcats were not the big cats that clawed their way into becoming the Slamfest 2014 champions. When the dust settled on the mats at the end of the day it was the Arlington Tigers who roared in victory. The Arlington Tigers defeated the Clarksville High Wildcats 40-28 in the Slamfest 2014 championship match. Clarksville, TN – At 9:00am Saturday morning, wrestling squads from 14 different schools converged at William Workman Gymnasium in Clarksville High School for the 2014 Slamfest. In addition to the Wildcats, the Rossview Hawks, Mt. Juliet Bears and last years Slamfest winners, the Cookeville Cavaliers were among the teams participating in the event this year. As usual, the first half of the day consisted of all the teams competing in pools. The top three finishers in each pool advance to the elimination rounds in the second half of the day, leaving only 12 teams. Clarksville, TN – The Northeast Eagles hosted a quadrangular meet Thursday night against the Hendersonville Commandos, Glencliff Colts and the Mt. Juliet Bears. The Eagles picked up two wins in the meet, but were ultimately grounded by the depth of the Bears in the final dual. Northeast Eagles hosted quadrangular meet Thursday. Fort Campbell, KY – For the first time since 2008, the Fort Campbell wrestling Falcons finish regional competition with two regional champions. 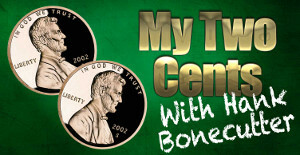 Ki Ryder and Gino Haywood both took first place in their weight class Saturday, February 15th. This is the fourth time Ryder has qualified for state competition. He has committed to wrestle at Wheeling Jesuit University in West Virginia. In addition to the two champions, the Falcons had six state qualifiers including Jake Jorstad who finished as regional runner up. Clarksville, TN – Most coaches begin their road to the sideline, bench or dugout somewhere between high school and college — or even latter in some cases – but for Austin Peay softball assistant coach Denny Boguskie his trek into coaching began almost at birth. 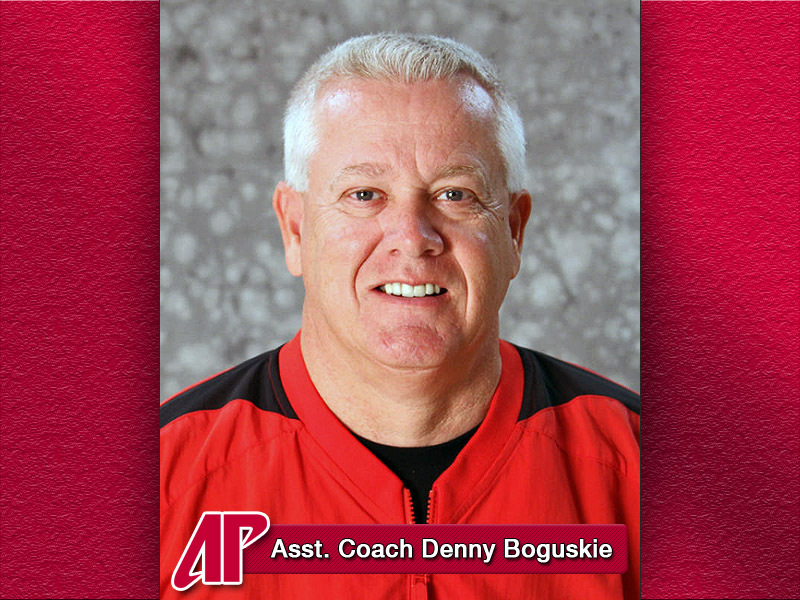 Boguskie is currently in his second season on the staff of Lady Govs head coach Stephanie Paris and grew up around baseball fields in Nashville, TN, as the son of longtime Nashville Vols standout Harold “Buster” Boguskie. Clarksville, TN – When Tommy Badon took over as coach of the Clarksville High School wrestling program he knew of the history and success the program has had in the past with district championship after district championship. Well, he and his Wildcats squad continued that tradition, January 21st at the William Workman Gymnasium, as CHS won its 18th straight district team dual championship with a 42-33 result in the finals versus West Creek High School. 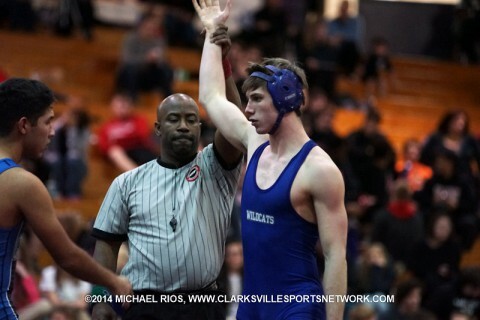 Clarksville High Wildcats wrestling defeats West Creek Coyotes in the District Championship Tuesday night.